Well you could say we got a little bit of snow! I took a couple of before and after shots which really don't look too bad. But it's all a matter of perspective. The photos on the left were taken after it had already been snowing most of the day. We had about 3-4 inches during the day but the real blizzard was just beginning. 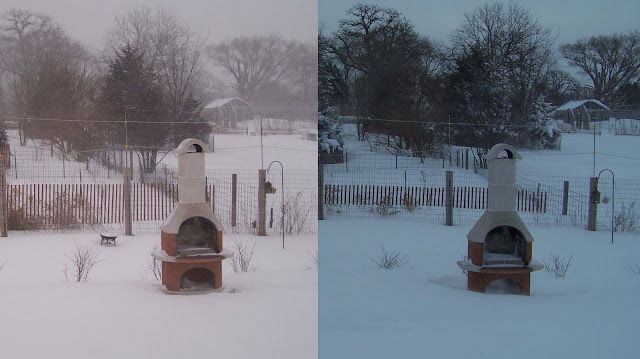 By the time I took the photos on the right this morning we had about 18 inches of snow. Notice that the bird bath has been buried! And here's the front steps on my front porch. The was incredibly windy and it created huge snow drifts. So for those of you unfamiliar with snow the blowing wind will pile it up into drifts many feet high and leave it almost bare in other areas. I took a few pictures before I went to bed last night. I couldn't believe the awesome shape left on the windows. Perfect snowy circles peering out into the night! Blowing snow and wind whistling very loudly outside. Here are the windows in the morning. I still think they look like eyes! I can't believe how huge the drifts were on our front porch. This is a picture of the biggest drift on the south side of the house.You can see the windows peeking over the top of the drift. Here comes the first snow plow of the day. We were just glad that it came by before we shoveled the end of our driveway. Of course the best thing about a snow day is no school! I think the sled hills and snow forts hold a very close second though. We have been told that there is another snow day tomorrow too! WOW!!! Cool (literally) photos. That looks COLD!! Brrr, I think I have to go put a sweater on now from just looking at them. The windows look cool though and it looks like you are having fun. So that's great! Just remember to stay bundled and safe. Boy! were you ever hit! We didn't have it nearly as bad although living right by the lake we tend to be lucky that way. Gorgeous! Your house is lovely - EXTRA lovely! I am looking out at snow, too. I put on my boots and took a few photos. Have a great week at school!